This sweet yet savory pasta salad calls for rotini noodles, fresh vegetables and a sweet cucumber vinaigrette. Nutrition Highlights: Cucumbers are a great source of potassium, which can help reduce blood pressure and heart rate. Cook rotini until al dente, and rinse. Combine chopped onion and cucumber in a bowl. Add cooked pasta. Combine remainder of dressing ingredients. Heat until sugar is dissolved. Pour over pasta, and refrigerate overnight. The next morning, add all of the vegetables. Add more of each fresh vegetable if desired. Combine with pasta and dressing. Refrigerate until ready to serve. 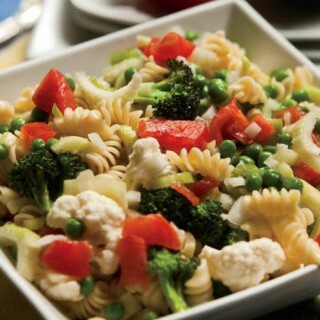 Omit or add any vegetables to flavor the pasta salad to your liking. To cut calories, use less sugar in the dressing. 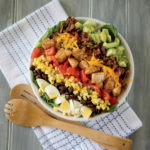 This just looks so colorful and delish! I must try it sometime. Do you know if it has been tested on children? My grandkids can be picky eaters.